Rated 'beginner' as there is little climbing or technical features. However it is nearly 100% hard-packed twisty singletrack through hardwood and cedar forests with a little grassy field riding as well. There is no preferred riding direction so riders should always keep their eyes focused ahead in case another trail user is coming the other way. It is common to find trail runners as well as children and families out enjoying the trail. Responsible night riding is allowed except during special events at Lions Club. Water and restrooms most of the year. Playground, picnic areas and pavilions, fishing lake, walking path, disc golf course. 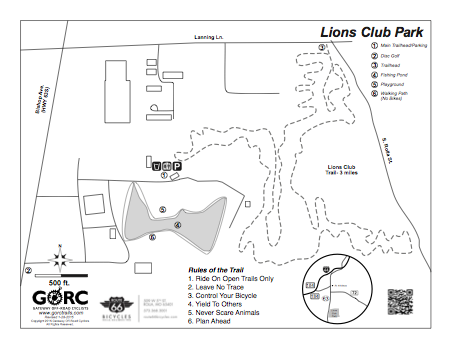 Lions Club Trail was built by volunteers in 2003 on unused park land owned by Lions Club of Rolla. From Interstate 44 exit 184 in Rolla. Head E on Business 44 (Kingshighway). South on S. Bishop Ave (Hwy 63). Park is on the left. A few pockets of mud fairly easy to ride around. Trail is excellent, one tree still down. bridge needs work, but rideable. few tacky spots to S. I got one tree off trail. Thanks to a hard working group of guys from Fort Wood, the trail is open for business.